Selling your first home can be an intimidating experience. For first time home sellers in Pueblo, Colorado, housing market acceleration means there are more houses on the market to compete with. The good news is that buyers are hungry. Here are tips for maximizing your profit as a first time home seller. The biggest mistake first time home sellers often make is pricing their house too high. You want your list price to be competitive from the start, in order to attract buyers within the first few weeks of your listing. Consider hiring a listing agent to help you. If you’re doing it on your own, be sure to look at comparable prices of other homes in Pueblo. Consider both asking prices and sell prices to help you come up with the perfect number. If you are in a situation where you are upside down in your mortgage or going through a divorce then selling your home fast may be your best option. Your house also needs to be ready to sell. This goes beyond basic cleaning. Clear out the clutter and move things into storage. Consider moving out some of your furniture as well. You want your home to appear spacious. If you have some simple repairs or replacements you’ve been putting off, fix things up before you put your home on the market. Buyers want to see homes that are move-in ready. Also, consider your curb appeal. The exterior of your home will be the first thing a potential buyer sees. Fresh paint and a well-manicured lawn can go a long way in setting your home apart for buyers. If you are just trying to sell quick for a cash profit, then cleaning your home is still a good idea because many home sales done by I Buy Pueblo Houses close in as little as 7 days. 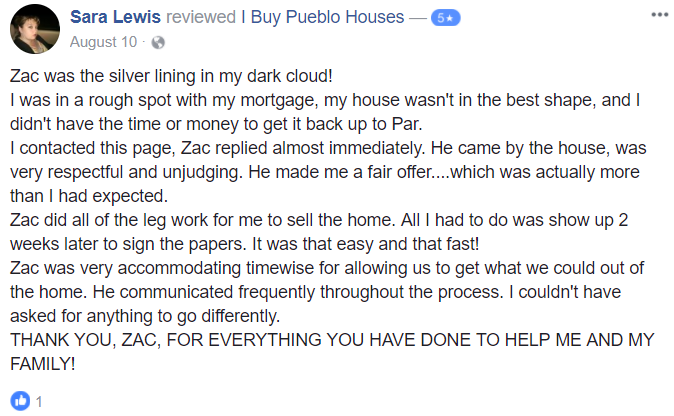 For first time home sellers, it’s important to make the process easy for your potential buyers, even if your buyer is I Buy Pueblo Houses. One way to do this is to be flexible with your showings. Have large blocks of time available to buyers and leave the house so they can view the space in peace. You may even want to go away the first weekend after you list your house to really maximize on showings. Another great option is to consider having an open house. This is a great way to draw in interested buyers. Be sure to put up signs and advertise for your open house in advance. If you are just trying to sell your house quick for cash, you may be able to bypass this process, since many sales happen in as little as 7 days. Another mistake first time home sellers make is waiting too long to respond to an offer. Make sure you pay attention to the date the offer expires and give your response in plenty of time. Buyers don’t like to wait regardless if the buyer is a business or a family. This might be the most important piece of advice to take to heart as a first time home seller. The housing market is constantly in flux. This means you may not sell your home as fast as you expected. It also means you could sell your house much sooner. Be prepared for both outcomes. It’s also important to remember that your home is only worth what someone is willing to pay for it. That means if the offers you’re getting aren’t quite where you were hoping they would be, you might have to consider dropping your price. Be open to all possibilities. Selling your first home can feel daunting at first. It’s important to understand the Pueblo housing market and be prepared for the home selling process before you get started. That is the best combination for a successful sale.